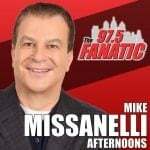 Dei Lynam is talking Sixers and taking your calls. Former Sixers general manager Billy King Joins the show in hour two. Dei discusses how to improve the Sixers bench, and gives her thoughts on the Jimmy Butler drama.